West 143rd Street between Hamilton Place and Broadway serves as the epicenter of a tightly knit social fabric that benefits hundreds of people, particularly children, who use it on a daily basis. The strongest strands of this network are the longtime resident elders, who take care of and watch the street, and the relatively newcomer group that runs the nonprofit youth development organization, The Brotherhood/Sister Sol. Deeply rooted in the neighborhood for decades and present every day in the summer, the elders are the eyes and ears of the block. They know all of the neighborhood residents by face and most by name. Many are from the same families and therefore relationships on the block are deeply enterwined. Regular barbecues, card games of Spades and Pinochle, and conversation are the primary activities of the elders: they consider the shaded sidewalk in front of the Frank White Community Garden and the garden structure at its entrance to be their outdoor living room. 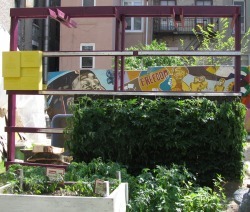 Although they have since passed on most of the gardening duties to younger, more able-bodied leadership, the elders founded the community garden in 1978 after three buildings were demolished on the site. Two of the buildings had burned and one was abandoned, a condition that resulted in a transformation of the three-lot site into an illegal dumping ground and then a chop shop and parking lot. Believing that both of these uses were unacceptable, a garden group was formed with members from the block association and other block residents. The purpose was to acquire a lease from GreenThumb, a city program, and use the site as a community garden. The garden was named in honor of Frank White, a neighborhood resident who was dedicated to the children of the neighborhood. As the story is told by the elders, an argument broke out between some young people and the driver of a car who wanted to enter the block during a block party. The driver then pointed a gun at the children. In an effort to protect the children, Frank White stepped in front of the gun and was killed by the gunman. Annual block parties, now in their twentieth year, are still organized by the elders every September. Occupying the brownstone adjacent to the Frank White Community Garden is The Brotherhood/Sister Sol, a youth development nonprofit organization that works with Black and Latino youth to define individual success and to seek achievement through the development of critical thinking and leadership skills, confidence, knowledge, creativity and a sense of responsibility for themselves, their peers, and the larger community. The Brotherhood/Sister Sol fosters high expectations and provides opportunities, guidance and mentorship, an array of resources, programs and activities, and perhaps most importantly, the love necessary for reaching both their individual and collective potential. Although much of the work of the organization takes place in public high schools where discreet chapters of teenagers meet every week, the garden and the brownstone are also host to a considerable program tightly bound to the children and the elders of the neighborhood. The organization was founded to work with high school aged youth but has expanded to include younger children, many of whom live on the block and have long familial ties to it. The brownstone is used for activities such as academic tutoring and college advisement (95% of students in the program attend college) as well as afterschool programs. A lawn for playing, climbing wall with an impressive graffiti piece, greenhouse, vertical tomato green walls, and an Ancestors Garden are just some of the myriad projects visible in the garden this year. Bro/Sis also organizes an annual Planting Day. The young people are centrally involved in all garden projects including landscaping, construction and maintenance.